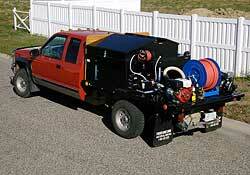 The Fire Responder One is a custom-built, low profile water tank, capable of fighting wild-land, oil, or grease fires. The unit comes with two different nozzles - one for oil and grease fires and another for grass fires - and each nozzle has a special foam capsule which multiplies the effectiveness of the water to extinguish the fire. 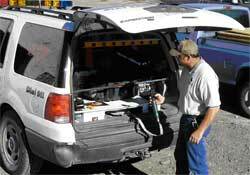 This Fire Responder One is installed in the back of the Treasure County Sheriff's K9-Unit SUV. 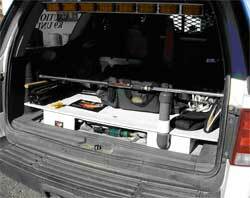 The low profile installation leaves plenty of room for the use purpose and is now a true multipurpose response vehicle. Montana Ag Plastics offers extensive plastic fabrication services for your spray equipment, storage, or just about any custom need. 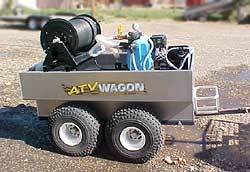 And we offer professional installation and repairs on spray equipment. 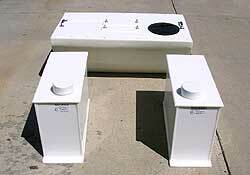 Please contact us to learn more about the plastic fabrication services we can offer you. We work with Warrne Chemical on repair of their equipment.